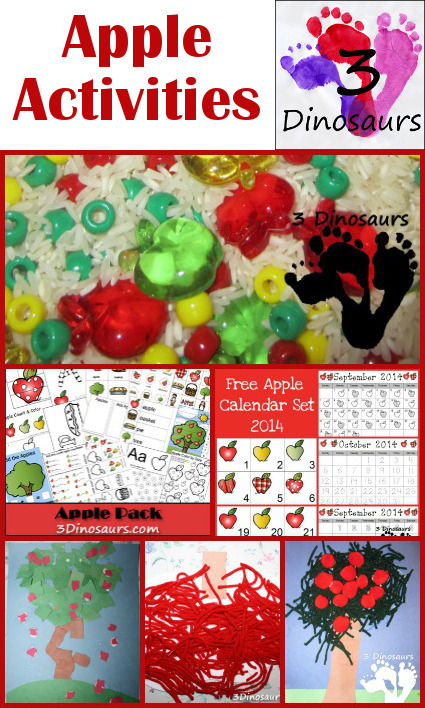 We have been getting ready for the fall with the start of our Apple Themes! 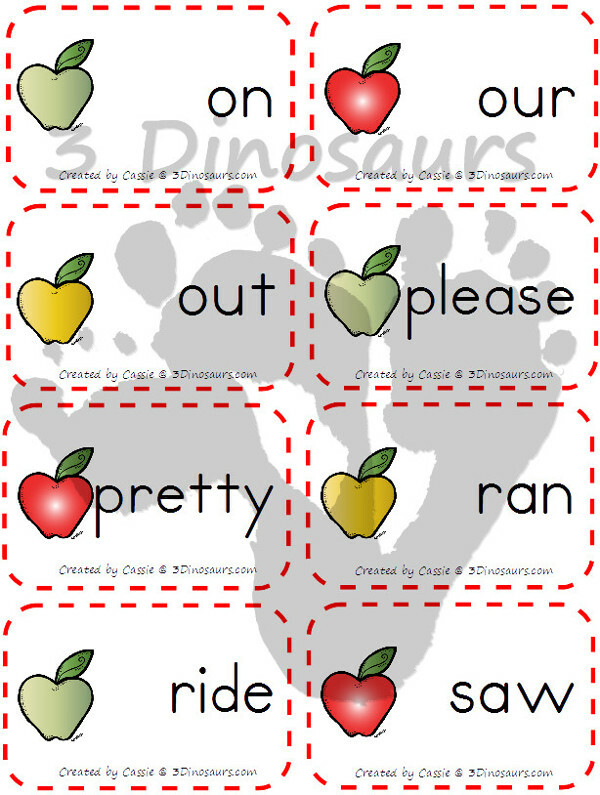 What would be more fun than an apple themed sight word cards to help work on the sight words during the fall! When you change themes kids love it. They love learning different ways. Apples were some of our favorite themes over the years. There are eight sight word cards on each page. Each card has different colors of apples: red, green and yellow. 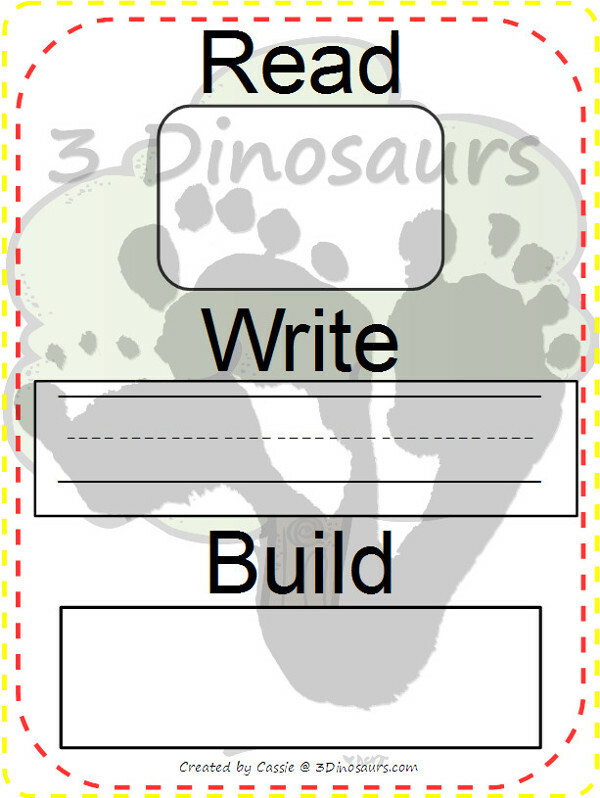 This printable is a fun way to work on the words. For the cards, we are going to use several times, I laminate them. 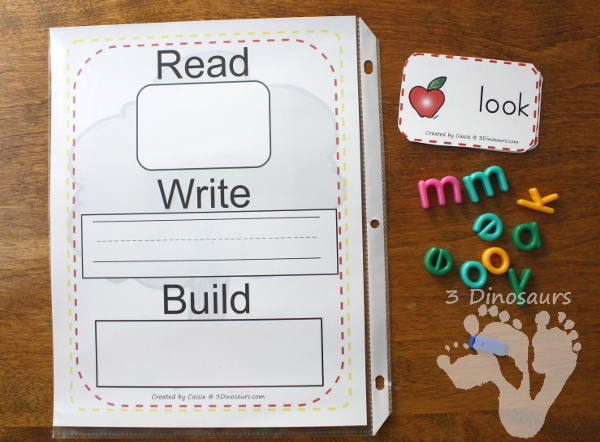 Each set has a Read, Write, and Build mat in them. They are tons of fun to use. You can mix in other cards to use on this mat as well. I laminate this mat if I don’t have laminating pouches (which does happens every now and then), I put them in sheet protectors . We used lacing lowercase alphabet beads to make our words. Here is an example of how I set up the station for them to use the cards and mat. 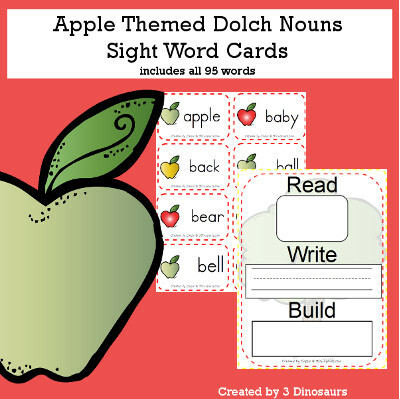 The Apple Theme Dolch Sight Words & Nouns Bundle has 51 pages. It is $5.50 for the whole set. 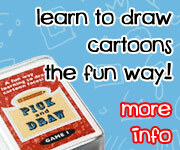 You can get a small sample of one of the cards here. The Apple Theme Dolch Preprimer Sight Words set has 6 pages. It is $1.25 for the whole set. It has the following words: a, and, away, big, blue, can, come, down, find, for, funny, go, help, here, I, in, is, it, jump, little, look, make, me, my, not, one, play, red, run, said, see, the, three, to, two, up, we, where, yellow, you. The Apple Theme Dolch Primer Sight Words set has 8 pages. It is $1.25 for the whole set. The Apple Theme Dolch First Grade Sight Words set has 7 pages. It is $1.25 for the whole set. It has the following words: after, again, an, any, ask, as, by, could, every, fly, from, give, going, had, has, her, him, his, how, just, know, let, live, may, of, old, once, open, over, put, round, some, stop, take, thank, them, then, think, walk, were, when. The Apple Theme Dolch Second Grade Sight Words set has 8 pages. It is $1.25 for the whole set. It has the following words: always, around, because, been, before, best, both, buy, call, cold, does, don’t, fast, first, five, found, gave, goes, green, its, made, many, off, of, pull, read, right, sing, sit. sleep. tell, their, these, those, upon, us, use, wash, which, why, wish, work, would, write, your. 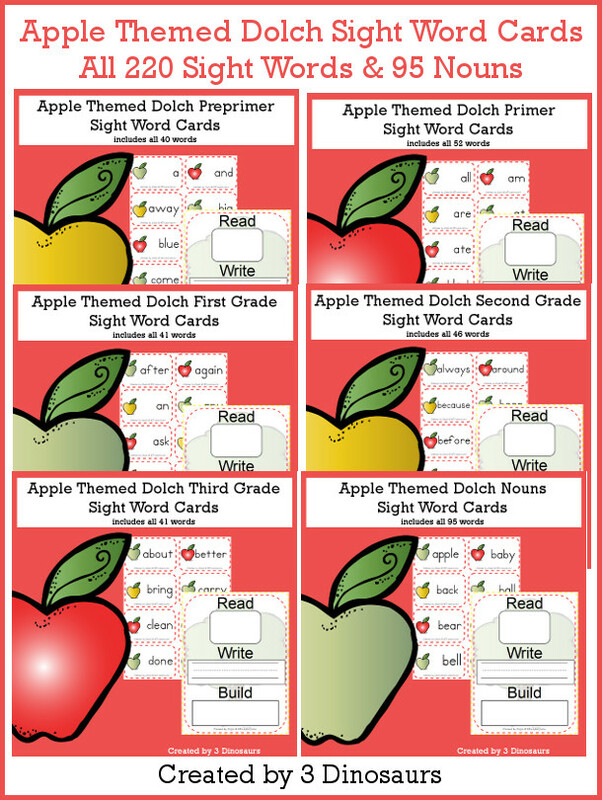 The Apple Theme Dolch Third Grade Sight Words set has 7 pages. It is $1.25 for the whole set. It has the following words: about, better, bring, carry, clean, cut, done, draw, drink, eight, fall, far, full, got, grow, hold, hot, hurt, if, keep, kind, laugh, light, long, much, myself. never, only, own, pick, seven, shall, show, six, small, start, ten, today, together, try, warm. The Apple Theme Dolch Noun Sight Words set has 15 pages. It is $1.50 for the whole set. 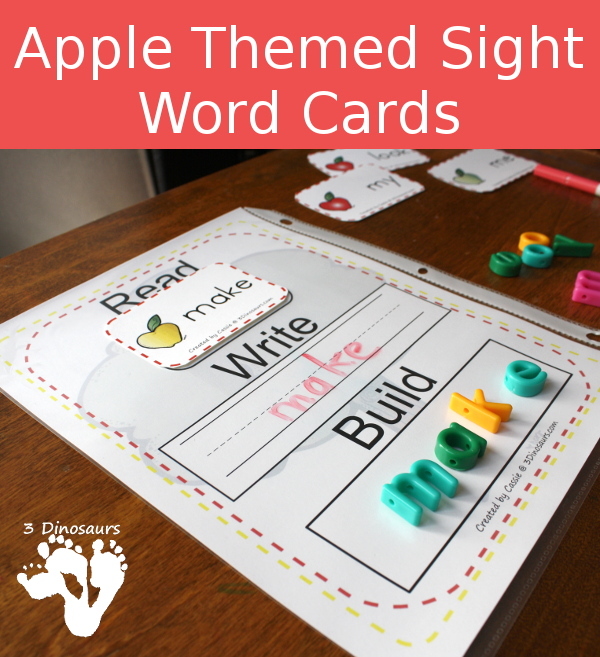 This entry was posted in learning to read, store and tagged apple, cards, first grade, nouns, preprimer, primer, printables, second grade, sight words, third. Bookmark the permalink.